The Rhône Valley in southern France contains some of the world’s greatest and most beautiful wine appellations. And it’s a region I’ve managed to almost completely ignore for a good 15 years. Rhône shmône. The problem is that I encountered the Rhône too early in my wine-drinking days. When I was about 21, my parents and I toured Provence — still one of my favorite vacations — and we visited the stone-built town of Châteauneuf-du-Pape. After climbing the hill to the ruined papal castle at the top, we descended into one of the town’s cellars for a tasting. There, I did not drink one of the wines that changed my life. This isn’t one of those stories in which I taste a wine and it opened my eyes to flavor and the joy of living. The wines didn’t dazzle me. But what did I know? I was barely an adult. They were, however, delicious enough to warrant my father buying a bottle or two to bring home. In my mid-20s, I regularly bought wine from the Côtes du Rhône AOC, the catch-all appellation for wines from the entire region, because they were popular but not too expensive. Eventually, I realized I didn’t care for the earthy note in the light-bodied reds I’d been purchasing. That was that, until I revisited Provence with a colleague in 2004. Our itinerary didn’t allow for a single winery visit, alas, and when we sped past the turn-offs to Hermitage and Condrieu — by then the names actually meant something to me — I cried a little bit. Well, on the inside. Unfortunately, I can’t afford Hermitage (perhaps the world’s best Syrah) or Condrieu (the world’s best Viognier) here at home. I can afford some Châteauneuf-du-Papes, when they’re on sale, but they have those fusty coats of arms on the bottles. And so the old Rhône lost its luster, and I turned my attention to shinier somm darlings like Jura. I’m not impervious to fashion. After recently tasting some Rhônes by M. Chapoutier, I feel rather foolish for having ignored a giant swath of the world’s loveliest wines for so long. 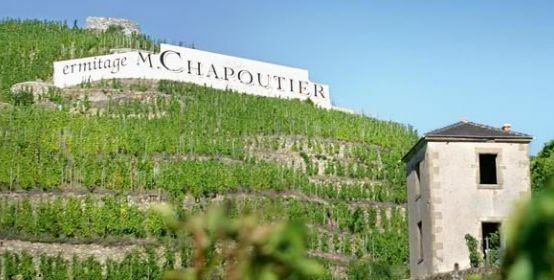 Chapoutier really came into its own in the 1990s, when Michel Chapoutier took over the merchant-grower company. In many vineyards he implemented organic and even biodynamic viticulture, which is sort of like organic viticulture combined with astrology and magic potions. In both cases, the goal is to increase the health of the vines by fostering a thriving ecosystem of bacteria and other beneficial organisms in the soil. Some studies show that biodynamic agriculture is more successful than organic, but it’s unclear exactly why. Whether you believe in biodynamics or not, the jump in the quality of the Chapoutier’s wine since Michel took the reins is undeniable. When I see the Chapoutier name on a bottle, I know there’s a very good chance I’m going to really enjoy the wine. 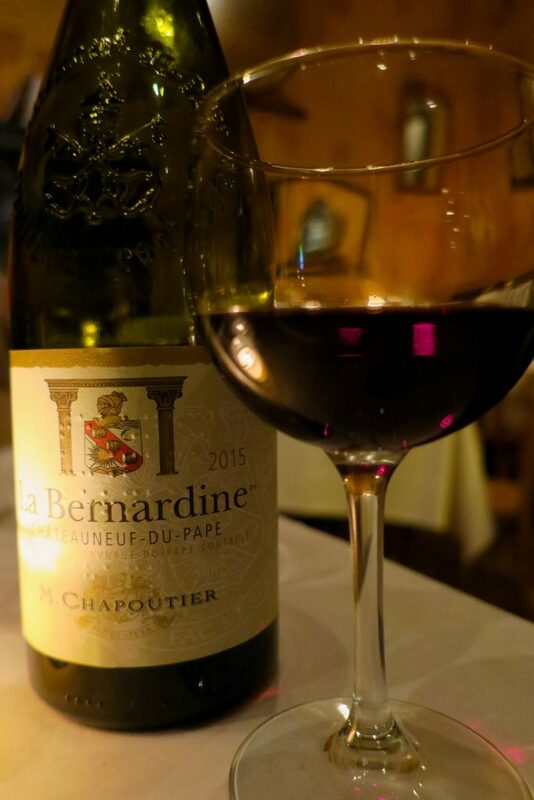 Many others must agree — Chapoutier has long since expanded out of its Tain-l’Hermitage base, with vineyards in the Alsace, Australia and Portugal, among other regions. 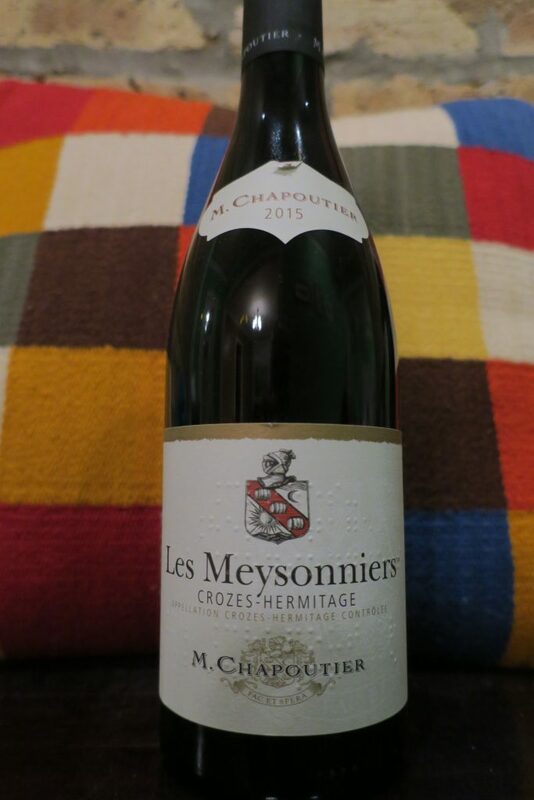 As a member of the #Winophiles wine-writing group, I received free samples of three Chapoutier wines from the Rhône. I took them to one of my favorite BYOB restaurants in Chicago, HB Home Bistro, and invited one of my zestiest wine-loving friends, Rebecca. In Rhône Valley’s southeast, the Luberon ranks among my favorite parts of France, with its stupendously scenic combination of vineyards, lavender fields, olive groves and hill towns. Unfortunately, this organic wine ranked as my least-favorite of the three wine samples. 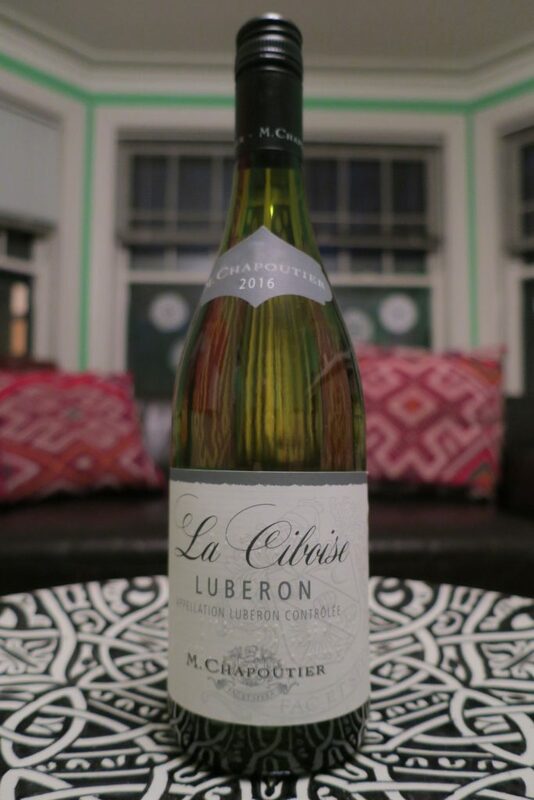 I liked its clean, melony aroma, marked by a “minty-flinty” note, as Rebecca remarked, but its loosey-goosey fruit didn’t integrate well with the taut, grapefruity acids or the savory notes. I liked it better with food — it rounded out more with some mussels — but I can’t unreservedly recommend this wine, even with its relatively modest $16 price tag. Chapoutier does something rather different with this wine, in that it’s 90% Grenache (the “Châteauneuf-du-Pape grape par excellence,” according to The Oxford Companion to Wine) and 10% Syrah, which “has been planted by producers who admire its tannins and structure, although, unlike Grenache and Mourvèdre, it needs care to avoid overripeness and is falling from favor in some quarters,” the Companion goes on to say. The use of Syrah is unusual, but even more so is the wine’s lack of other grapes. Most Châteauneuf-du-Papes are blends, which can be composed of up to 18 different grape varieties, though very few wines use them all. According to the information sheet from Terlato that I received with the wine, “minimizing grape varieties allows for true expression of the terroir, which appeals to consumers for the authenticity and sense of place.” The wine no doubt expresses its terroir, but it strikes me that “authentic” Châteauneuf-du-Papes have more traditional blends. Authenticity, however, is overrated, and this wine is sheer delight, both with and without food. I particularly loved it with some bacon-wrapped dates. It’s expensive at about $60, but you’re getting what you pay for. Tiny Hermitage produces some of the world’s greatest wines, with impressive price tags to match. Mere mortals should opt instead for a Crozes-Hermitage, a wine from the vineyards surrounding the more august Hermitage appellation. Both appellations focus mostly on Syrah. According to The Oxford Companion to Wine, “The best reds are softer and fruitier than Hermitage because the soils are richer (and because it’s more difficult to justify barrel aging at Crozes prices), but they tend to share more of Hermitage’s solidity than St-Joseph,” an appellation on the opposite riverbank. This 100% Syrah is made with biodynamically farmed grapes, and the technique seems to have paid off. I loved the aroma of ripe plum, blueberry jam and leather, as well as the big, beautiful flavor. The wine moved from deep, rich fruit to elegant acids, refined spice, that note of leather again and finally some fine-grained, well-integrated tannins. I relished this wine on its own, but with the bacon-wrapped dates, it dried out and evaporated. It also failed to pair well with my too-spicy main course of beef bulgogi with kimchi and spaetzle. I suspect it would have fared better with a simple steak. It’s not inexpensive at $44, but again, this is a wine with some real stuffing. I’m so glad to have received these samples. They reminded me of what a joy the wines of the Rhône can be. I’m going to keep my eye out for Châteauneuf-du-Pape and Crozes-Hermitage the next time I need a special-occasion wine. Neither is at the forefront of wine fashion at the moment, but that doesn’t mean they aren’t delicious. Welcome back to the Rhone, Rob! 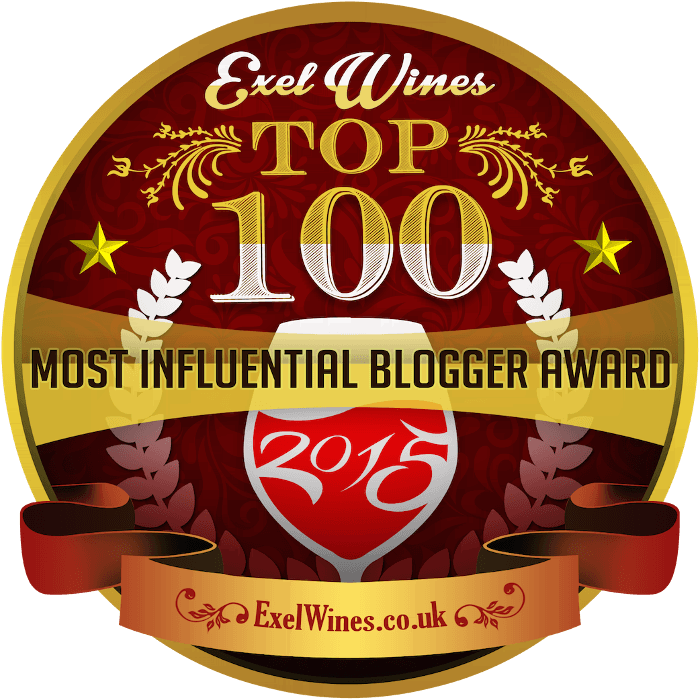 Thanks for sharing your wine “non-discovery” moment! Made me smile. It’s great to be back, Jeff! Better late than never! I love the descriptions of the wines–they really brought me to the glass. I do love the Rhône (and Chapoutier!) I’m so glad you have refound the region. Thanks, Nicole! And me too — I’ve been away for far too long. 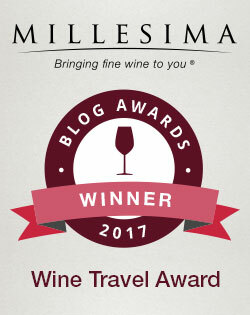 I recently had a similar experience with Bordeaux Rob, so I totally get where you’re coming from Lovely write up of the wines! Thanks, Martin! Yes, I suspect many of us have our wine blind spots and prejudices. It’s always kind of exciting when I find wines that change those! Like you, Hermitage and some other Rhone wines are out of my budget. I’ve had many Côtes du Rhone that are fabulous, especially given the QPR. But perhaps time to branch out. Enjoyed your post Rob! Thanks, Lynn! It’s been ages since I’ve had a Côtes du Rhône, but I may have to revisit them. Certainly I’m going to pay more attention to wines from the region, whether CDR or a more specific appellation. Just when we think we know our taste preferences, we are proven wrong. The wine industry continues to evolve and that is why we continue to taste and consume more wine! Enjoyed reading your post. Great descriptions on the wines. Thanks, Jane! Absolutely — there are surprises in just about every wine region, to be sure. Absolutely. But it wasn’t Old World wines that were the problem, it was those cheap earth-bomb Côtes du Rhônes. I still don’t like wines that emphasize earth over fruit. I know they’re fashionable, and I can appreciate them intellectually, but they’re not to my taste. Fortunately, there’s plenty of fruit to be had in the Rhône! Sounds like you’ve come full circle! The Rhone definitely warrants a place in one’s wine rotation I’d say. You bet — I regularly pass by that section in the wine shop, but I’m definitely going to give it a second look from now on. Ah, for the visits to France that happened before we were enamored with wine! I’ve a few of those stories, too, and am making up for lost time. Thanks for a really enjoyable trip! Good God, man – Talk about missed opportunity! But, now you get the joy of makeup drinking. I did get emotional the first time I drank Vacqueyras – a southern Rhône cru. I’m an evangelist for the crus of the southern Rhône. We we share bottle next let’s find some. Well, I may not have visited any wineries, but I certainly had fun filling my time in other ways! Oo, and I’ll have to try a Vacqueyras. I can’t think of the last time I’ve had one, if ever. So glad you have come back to the Rhone. My favorite wines. Great thoughtful article. Thanks for your kind words! It’s definitely fun to be exploring a wine region I’ve ignored for a while.